As soon as I saw pool noodles in the store, I knew that I had to buy a few. But they aren’t for us to take to the beach this summer. 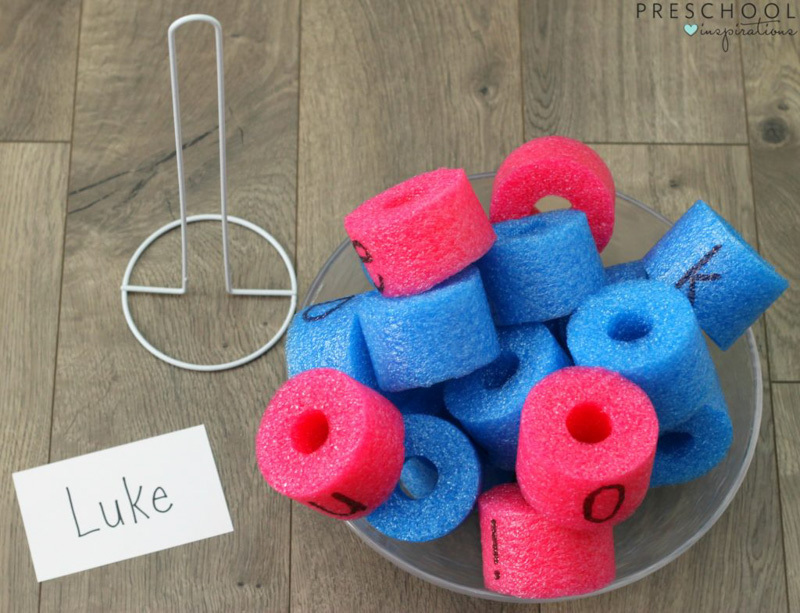 I bought these water toys so my preschool could practice spelling his name in this fun Pool Noodle Name Recognition Activity. 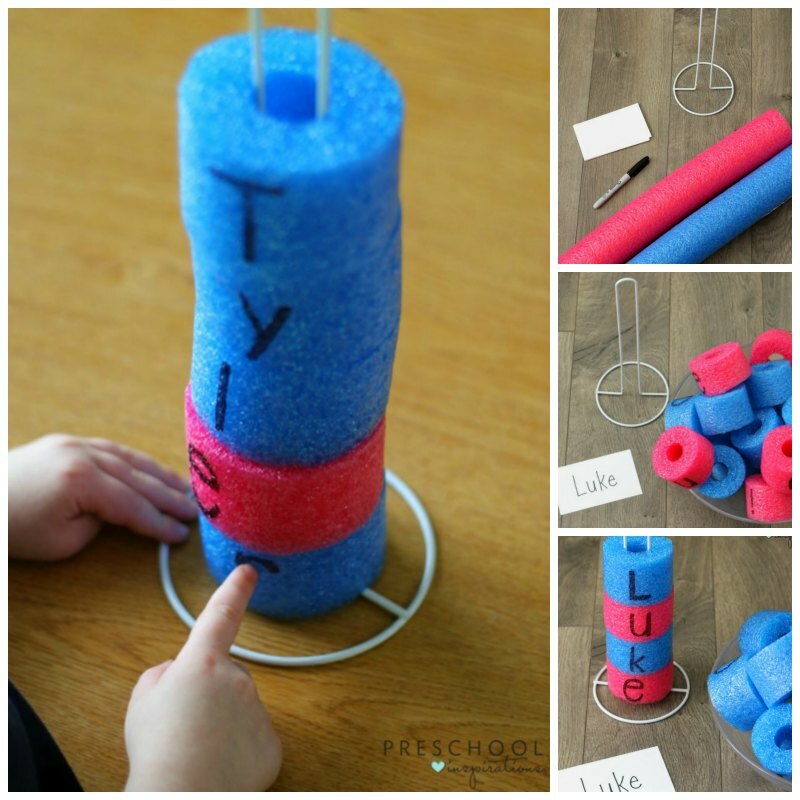 This hands-on activity is not only a great way for your child to practice identifying letters and spelling his or her name, but it’s also a great way for your kids to develop their fine motor skills and hand and eye coordination too. 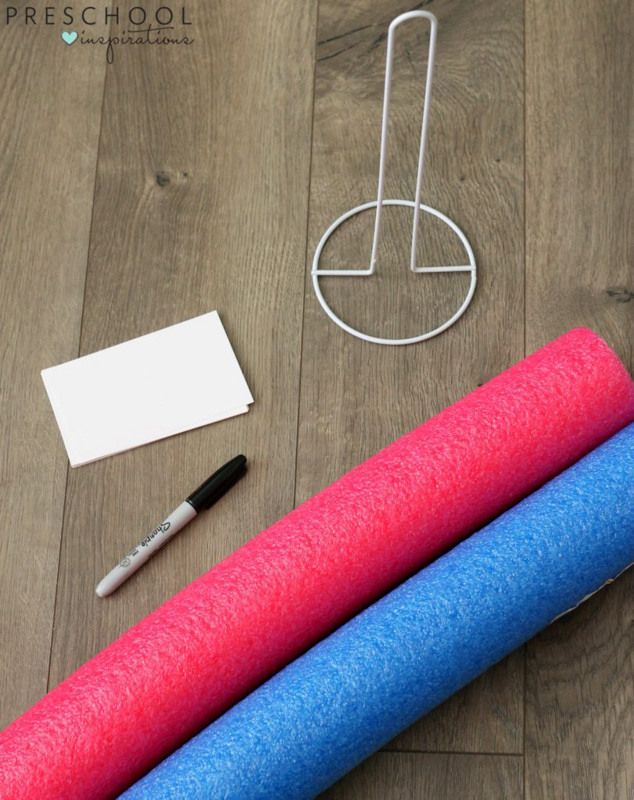 Cut the pool noodles in 1 1/2 – 2 inch pieces. Write the consonant letters on the blue pieces and vowels on the pink ones, and then put all of the pieces into a container. Write your child’s name on an index card. 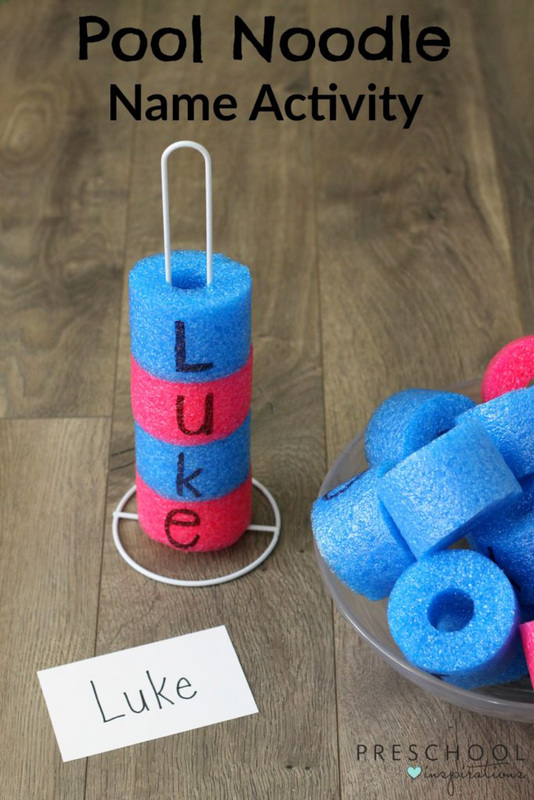 Place the pool noodle letters and the paper towel roll holder on a table, floor, or other work surface. If you don’t have a paper towel roll holder, you can also put a dowel into a ball of play dough or piece of Styrofoam. First, your child will find or her name written on an index card. He or she will next find the pool noodles with the letters from his or her name written on them. Then, your child will put the pool noodle letters on the paper towel roll in order to spell his or her name. Note: This may be best to do by tilting this over so that children can do left to right. To extend the learning, have your child practice match capital and lowercase letters or spell simple words. You can also write the names of family members, friends, and even pets. If you are a classroom teacher, write all of your students’ names on index cards so they can practice spelling their classmates’ names. Love this idea for my PreK3s. I purchased the noodles and towel holders. My only concern, unless I am misunderstanding, is the will need to spell their names backward since the last letter will be on the bottom. Thoughts? Thank you! Hi Julie Ann! Turn the paper towel holder on it’s side, and write the letters sideways, and it will work like a charm :). Thank you! Was “Leaning” that direction in my thoughts. Love your site!